Joseph Frank Pesci (/ˈpɛʃi/ PESH-ee, Italian pronunciation: [ˈpeʃːi]; born February 9, 1943) is an American actor, comedian and singer. Known for portraying tough, volatile characters, in a variety of genres. He is best known for his collaborations with Robert De Niro and Martin Scorsese in the films Raging Bull (1980), Goodfellas (1990), and Casino (1995) and the upcoming The Irishman (2019). He also appeared in Once Upon a Time in America (1984), Moonwalker (1988), JFK (1991), and A Bronx Tale (1993), and The Good Shepherd (2006). His comedy roles include such films as My Cousin Vinny (1992), Home Alone, Home Alone 2: Lost in New York, and the Lethal Weapon franchise. Pesci was born on February 9, 1943, in Newark, New Jersey. His mother, Maria Mesce, worked part-time as a barber, and his father, Angelo Pesci, was a forklift driver for General Motors with Torinese origins and a bartender. Pesci, of Italian descent, was raised in Belleville, New Jersey, and attended Belleville High School. By the time Pesci was five years old, he was appearing in plays in New York. At age 10, he was a regular on a television variety show called Startime Kids, which also featured Connie Francis. As a teenager, Pesci was friends with singers Frankie Valli (who was nine years his senior) and Tommy DeVito (who was 15 years his senior), and in 1959, at age 16, he helped introduce them to singer and songwriter Bob Gaudio, which led to the formation of the band the Four Seasons. In the 1960s, Pesci began working as a barber, following in his mother's footsteps. At the same time, he tried to start a musical career, playing guitar with several bands, including Joey Dee and the Starliters who introduced the "Peppermint Twist" record, dance, and Peppermint Lounge in NYC. In 1968, he released his debut album Little Joe Sure Can Sing! (billed as Joe Ritchie), on which he sang covers of contemporary pop hits. In the late 1960s and early 1970s, Pesci joined fellow actor Frank Vincent in performing in local clubs including the Arlington Lounge and other venues around North Jersey as Vincent and Pesci. The comedy duo's material was a play on Martin and Lewis and Abbott and Costello. In 1975, they appeared in the Broadway show The New Vaudevillians, which only lasted one week. The first film Pesci starred in was the 1976 low-budget crime film The Death Collector alongside Frank Vincent. After the film Pesci returned to The Bronx and lived above Amici's Restaurant, where he was an employee. In 1979, Pesci got a telephone call from Martin Scorsese and Robert De Niro, who were impressed with his performance in The Death Collector and asked him to co-star in Scorsese's Raging Bull as Joey LaMotta. Pesci won the BAFTA Film Award for Newcomer to Leading Film Roles in 1981 and was nominated for an Academy Award for Best Supporting Actor. Over the next few years, Pesci appeared in several smaller films, including Dear Mr. Wonderful (1982), Easy Money (1983) and Eureka (1983). In 1984, he was cast in Once Upon a Time in America, again appearing alongside De Niro. The following year he starred as private detective Rocky Nelson in the short-lived television comedy series Half Nelson. In 1988, Pesci appeared in the Michael Jackson musical anthology film Moonwalker, in the film's sixth and longest segment, "Smooth Criminal." He played the antagonist, crime boss Frankie "Mr. Big" LiDeo (an anagram for one of the film's producers and longtime Jackson manager Frank DiLeo, with whom Pesci later acted in Goodfellas). He appeared as Leo Getz, a comedic sidekick and best friend to protagonist detectives Martin Riggs (Mel Gibson) and Roger Murtaugh (Danny Glover) in the Lethal Weapon sequels, released in 1989, 1992 and 1998. In 1990, he reunited with Scorsese and De Niro for Goodfellas, wherein he played mobster Tommy DeVito, based on real-life mobster Thomas DeSimone. (Tommy DeVito is also the name of Pesci's old acquaintance from Belleville, New Jersey, and a member of The Four Seasons, but contrary to popular belief, the naming is coincidental.) Old friend Frank Vincent also appears in the film; Pesci's character kills Vincent's character in a rage in one of the best-remembered scenes in the film after the Vincent character contemptuously tells him to "go home and get your [shoe] shine box." Pesci received the Academy Award for Best Supporting Actor for the role, which he accepted with one of the shortest speeches in Oscar history, saying simply, "It's my privilege. Thank you" before leaving the stage. Pesci also co-starred in the blockbuster Home Alone in 1990, playing Harry Lyme, one of two bumbling burglars (along with good friend Daniel Stern) who attempt to burgle the house of the young character played by Macaulay Culkin. During filming of the film's climactic scene, Pesci accidentally bit one of Culkin's fingers, giving him a scar. Two years later, Pesci reprised his role in the sequel Home Alone 2: Lost in New York. Pesci played David Ferrie in 1991's JFK. In 1992 he appeared as the title character in the comedy My Cousin Vinny with Ralph Macchio, Marisa Tomei and Fred Gwynne. The same year, Pesci spearheaded the cast of The Public Eye as Leon "Bernzy" Bernstein, a photographer. His performance in the film, a departure from his usual characters, was critically acclaimed. Pesci hosted sketch comedy show Saturday Night Live on October 10, 1992, while doing publicity for My Cousin Vinny. During his monologue, he restored a picture of Pope John Paul II that had been torn by Sinéad O'Connor on the previous broadcast. Pesci had a small role in 1993's A Bronx Tale as Carmine. The film starred Robert De Niro and Chazz Palminteri, both of whom made the film and personally offered Pesci the role. In 1995, Pesci had his third collaboration with Scorsese and De Niro in the film Casino, playing Nicky Santoro, based on real-life Mob enforcer Anthony Spilotro, along with Sharon Stone and James Woods; Pesci had previously co-starred with the latter in Once Upon a Time in America. In 1996, Pesci was considered to play Myron Larabee, the stressed-out postman, in Jingle All the Way opposite Arnold Schwarzenegger, but the part was ultimately given to Sinbad, whose physical size was more comparable to Schwarzenegger's. He had starring roles in several other films, including Man on Fire (1987), The Super (1991), Jimmy Hollywood (1994), With Honors (also 1994) and Gone Fishin' (1997). Pesci's role in With Honors was a dramatic role in which he played a homeless man living on the campus of Harvard. In 1998, he released his second album, and his first in 30 years, Vincent LaGuardia Gambini Sings Just for You, which was named after his character from the 1992 film My Cousin Vinny. The album was both humorous and serious, exploring a variety of genres, though most of it was big band jazz. The album spawned the single "Wise Guy," a rap number that played on the gangsta theme by making reference to Mafia gangsterism. "Wise Guy" interpolated the 1980 hit "Rapture" by Blondie, and was co-written and produced by the hip-hop production team the Trackmasters. In 1999, Pesci announced his retirement from acting to pursue a musical career and to enjoy life away from the camera. He returned to acting when he did a cameo in De Niro's 2006 film The Good Shepherd. In 2010, he starred in the brothel drama Love Ranch, alongside Helen Mirren. Pesci appeared with Don Rickles in a 2011 Snickers advertisement in which he portrays the angry alter ego of a young man who attends a party and becomes agitated by two women until he is calmed down by eating a Snickers bar. In 2011, Pesci sued Fiore Films, the producers of the film Gotti, for having broken their promise to cast him in that film as real-life mobster Angelo Ruggiero. Pesci stated that he had gained 30 pounds (14 kg) for the role. He sued them for $3 million, which was the payment he had been promised. The lawsuit was settled out of court in 2013 for an unspecified sum, and the role, after many production delays, eventually went to Pruitt Taylor Vince. Pesci appears in the 2016 music documentary Jimmy Scott: I Go Back Home in which he is filmed recording "The Folks Who Live on the Hill" from Scott's forthcoming posthumous album I Go Back Home. 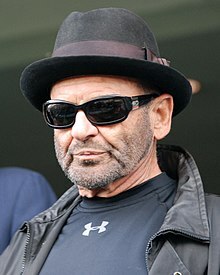 In 2017, Pesci was confirmed to be starring in The Irishman with long time collaborators Robert De Niro and Martin Scorsese. The film is planned for release in 2019 and will be distributed by Netflix. Pesci is a character in the 2005 musical Jersey Boys, which tells the story of The Four Seasons, due to his involvement in the band's formation. He is similarly a character in the musical's 2014 film adaptation. In the film, the Joe Pesci character asks "Funny how? ", a quote from Goodfellas. Pesci was briefly a recurring character on Saturday Night Live, played by Jim Breuer. Breuer's characterization was based on Pesci's GoodFellas character, re-imagined as a talk show host, but maintaining Tommy DeVito's violent temper, often beating his guests with a baseball bat. This recurring gag eventually culminated in the real Pesci appearing in a cameo and beating Breuer with a bat. Pesci has been married and divorced three times. His first marriage was in 1964. His third was from 1988 to 1992, to Claudia Haro, a model and actress with whom he has a daughter named Tiffany. In 2007, Pesci was engaged to Angie Everhart, but the couple broke up in 2008. While filming scenes in two of Martin Scorsese's films (Raging Bull and Casino), Pesci broke the same rib, 15 years apart. 1992 Tales from the Crypt Vic / Jack Episode: "Split Personality"
Saturday Night Live Himself / Host Episode: "Joe Pesci/The Spin Doctors"
^ a b c Harrison, Nancy (March 8, 1992). "Joe Pesci? That Guy Is Some Kind of Character". The New York Times. New York: NYTC. ISSN 0362-4331. Retrieved October 21, 2015. ^ "Joe Pesci". celebritywonder. Archived from the original on March 21, 2011. ^ a b "Jersey Boys Movie vs True Story - Real Frankie Valli, Tommy DeVito". HistoryvsHollywood.com. Archived from the original on June 27, 2015. Retrieved October 21, 2015. ^ a b c d e "Joe Pesci biography". Yahoo! Movies. ^ "Moonwalker (1988)". IMDb. Retrieved October 21, 2015. ^ a b "The 63rd Academy Awards Memorable Moments". Academy of Motion Picture Arts and Sciences. 2015. Retrieved October 21, 2015. ^ "10 Oscar Winners Whose Speeches Were Under 11 Words". mental_floss. Retrieved February 13, 2016. ^ Brozan, Nadine (October 12, 1992). "CHRONICLE". The New York Times. ISSN 0362-4331. Retrieved March 13, 2017. ^ "Three join Helen Mirren and Joe Pesci in 'Love Ranch'". Topnews.in. February 13, 2008. Retrieved January 25, 2010. ^ "There is an Angry Joe Pesci in all of us Snickers Ad". mememachine. Archived from the original on June 13, 2011. ^ a b c d "Joe Pesci settles dispute over "Gotti" film payday". CBS/AP. February 5, 2013. ^ "Scorsese, De Niro, and Pesci Back Together in The Irishman Set Photos". Screen Rant. September 23, 2017. Retrieved September 25, 2017. ^ "Now They're Good Fellas Ray Liotta And Joe Pesci Were Cold-blooded Wiseguys In Their 1990 Movie, But In Films Opening This Weekend, They're Unlikely Heroes. Joe Pesci Is Out For Justice". philly-archives. Retrieved October 21, 2015. ^ Katsilometes, John. "Joe Pesci remembers his own honeymoon in Vegas -- meeting the Rat Pack". Las Vegas Sun. Retrieved October 21, 2015. ^ Reardanz, Karen (July 30, 2007). "Pesci to Wed Everhart". San Francisco Chronicle. Retrieved July 31, 2007. ^ "Pesci ends engagement with model Everhart". Ireland On-line. April 25, 2008. Archived from the original on April 30, 2008. Retrieved April 25, 2008. ^ Dutka, Elaine (February 22, 1997). "'I Am the Movies I Make': Martin Scorsese's passion and commitments earn him the AFI's most prestigious honor". Los Angeles Times. Retrieved January 23, 2014. Joe Pesci testified to Scorsese's mania for realism. During a fight scene for Raging Bull, he took such a beating from De Niro that he fell to the ground with a broken rib, he recalled. When a couple of 275-pound 'heifers' fell on him the wrong way in Casino, that same rib was broken again. ^ Galuppo, Mia (February 21, 2017). "Martin Scorsese's 'The Irishman' Heads to Netflix From Paramount". The Hollywood Reporter. Retrieved February 23, 2017.